The key agent in attacking the Trump Presidency is the evil, beady-eyed, expressionless Rod Rosenstein, a deep state agent, one of tens of thousands infesting our Federal Government and working for powers other than the United States. Rosenstein is a conscious agent of the Shadow Government, the dark side of those behind the International Banks, such as the FED, Goldman-Sachs, the IMF, etc. Rosenstein, a total snake, wrote to Trump to fire Comey, and then within a few hours appointed a “Special Prosecutor” whose job would be to hound Trump out of office, even though there was no identified crime for Mueller to investigate. There was no need to appoint a Special Prosecutor, and there still is not a scintilla of evidence in the public arena that Russia “meddled” in the 2016 Presidential election — even though all the Big Media, including FOX, keeps repeated the “Russia meddled in our elections” fake news mantra. Enemy of the United States and blood-thirsty warmonger John Bolton, another unregistered foreign agent, said today that the non-existent “Russian Meddling” threatens the existence of the United States (what a lying piece of garbage). Robert Mueller is a pathetic, compromised, deep-state agent, just like James Comey. Two men who’s very facial expression tells you that they started out with good intentions many decades ago, but got compromised by a power structure they didn’t even know existed when they started their careers. When you hear CNN, MSNBC, the rest of the Big Media, and many of the quisling US Senators saying that Robert Mueller is of “impeccable” integrity” — you know he is one of the most dangerous malefactors on the planet. As our top “pinned post” states on the home page states: half way measures will not work. President Trump — you must attack all the false premises upon which your enemies are proceeding, if you are to prevail and prevent them from destroying you. One of those false premises is Robert Mueller as FBI Director “getting us through 9-11”. In fact, Mueller was part of a criminal coverup of key aspects of the aftermath of 9-11. To put Robert Mueller on the defensive, publicly challenge him on why, as FBI director, he did not investigate the collapse of building 7, which fell about 8 hours after buildings 1 & 2, without being hit by a plane. And, especially, challenge him publicly as to why he allowed someone to destroy the crime scene in New York City at ground zero, by loading the pieces of the fallen steel columns from buildings 1 & 2 into trucks, driving them away, and shipping them to Red China. (!!!) There is more. We would recommend you challenge the entire cover story of 9-11, but, short of that, raising these two issues to Mueller allow you to put him on the defensive, communicate his total lack of integrity to the discerning public, and lay the groundwork to end his malicious fishing expedition. So Rosenstein should be fired as soon as possible and exposed publicly with great ridicule, — on Twitter, Facebook and elsewhere — with regard to his starting the “Witch Hunt” against yourself and your family in earnest by needlessly appointing Mueller as Special Prosecutor. Same with Mueller – fire him as soon as possible. Take a stand against appointing a Prosecutor in search of a crime — the American people will agree with this. Constantly emphasize that Mueller is maliciously in search of a crime, for the sole purpose of hounding Trump out of office, and that he is a hit man for the deep state. Hannity has made the term “deep state” widely known to tens of millions of Americans. Jeff Sessions: disappointing. What is the matter? By recusing himself Sessions gave credence that there is some substance to “the Russians meddling in our elections” fake news effort. Sessions is suddenly coming off as a weak-sister, another compromised man. He should un-recuse himself and take care of business. It is a miscarriage of justice to allow the Rosenstein/Mueller/Media combine to obstruct the Trump agenda, voted in by the American people, with a groundless witch hunt. What’s going on is revealed in Traitor and former CIA Director John Brennan’s statement yesterday in Aspen that if Trump fires Robert Mueller that no one should obey his orders anymore, and that there should be a “coup” against President Trump. Evil Brennan also said that Trump is a threat to the future of the US government. Yes, Brennan, Trump is a threat to the hoped-for world tyranny that you and your disgusting ilk are striving to bring about THROUGH your infiltration of the US government. How much clearer can it be? Brennan is telegraphing to those with eyes to see and ears to hear that the Shadow Government, which he is part of, should do anything necessary to nullify the 2016 Presidential election. Brennan also has telegraphed that the Deep State/Shadow Government’s hopes to bring down Trump — are pinned on Rod Rosenstein’s Special Prosecutor, Robert Mueller. Brennan identifies firing Mueller (ruining their plot against Trump and the American people) as the trigger to initiate a “coup” against the elected President. 1. Demand that the Big Media or someone in Congress reveal publicly EXACTLY how “the Russians meddled in our elections” — this constantly made charge is NEVER defined by the Fake News Big Media, or Congressman like sleazy Adam Schiff. 2. Demand that former FBI Director Robert Mueller publicly address why he permitted the coverup of Building 7 and the destruction of the crime scene in New York City in the aftermath of 9-11. 3. 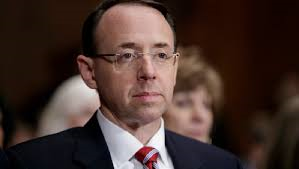 Get rid of Rod Rosenstein while publicly identifying as a Deep State agent who appointed the Special Prosecutor for the sole purpose of destroying the Trump Presidency, one way of the other. 4. And, of course, make the nationwide call for Trump Supporters to flood the Precinct System in both major parties, as explained in the “NEW Open Letter 2017” menu tab at OpenLetterToDonaldTrump.com — this will put your enemies in Congress and the deep state totally on the defensive, as they will be on their way out.